The following is photographic documentation of my mighty mancats, Dylan and Dante, exploring the far reaches of the Arctic tundra that is our back deck. 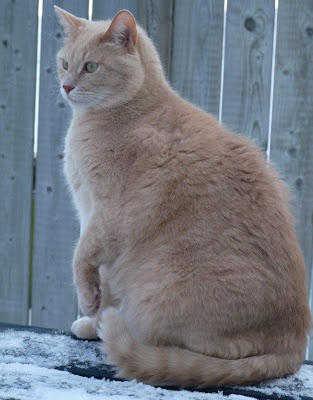 Daddy was so kind to shovel the snow off the deck and the benches so the mancats wouldn't have to plunge their dainty feet into the cold white stuff. He couldn't clear off the ice, however, so tender paw pads were still exposed to the frigid conditions. 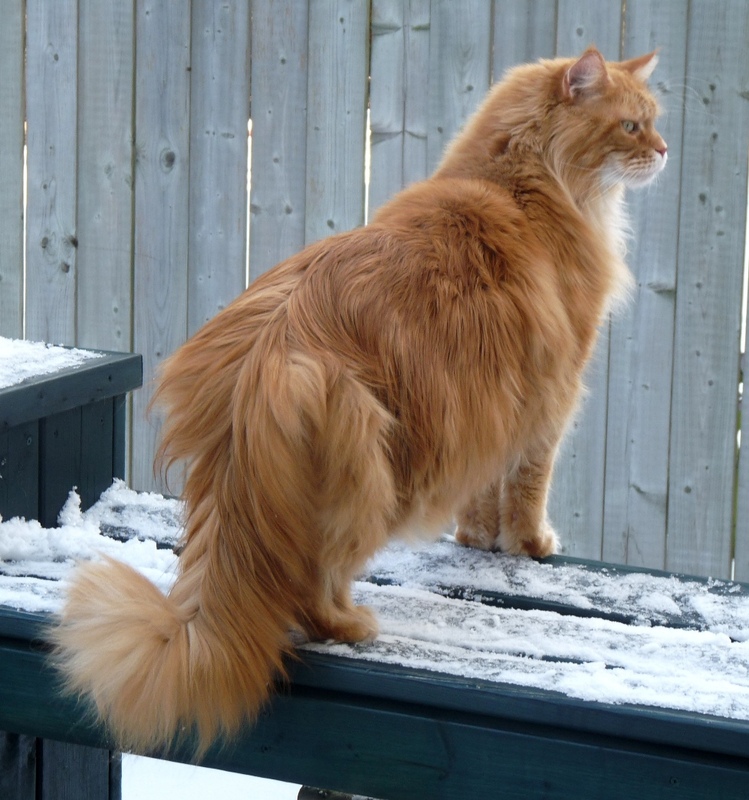 To their credit, my mancats spent some time checking out their frozen territorial expanse. They had to sniff out every corner and examine every square inch. After all it has been well over a month since they had last stepped foot on deck. Here is the evidence of their brave Arctic venture. Something under here sure smells good! Just look at that frozen wasteland! It used to be all green. You check the other way, while I check in this direction. There's something in the air, and on the stair! You can never be too careful when you're this far from home. You sniff high and I'll sniff low. I see lots of footprints frozen in the ice! Hmmm! There's some up here, too! Everywhere you look, there's evidence of invasion! Must be some type of abominable snowsquirrel! Here's one for the front cover! And this one's for the back! Dylan and Dante, having completed their mission, posed for the cover shots of the magazine where the findings of their expedition will be published. Watch out for them in the next issue of "Frosty Felines", coming out at the end of this month. We're just so glad they are safe and sound back home after risking their lives in such dangerous conditions. They're planning another expedition come Spring. What courageous mancats are they! You guys did a great job showing us around your front porch! We loved the cover shots too. So nice of you dad to shovel the snow for you...still looks mighty cold for toesies though! Very courageous indeed! It looks soooo cold! Do you really have snow? We had rain here a couple of days ago, and the little bit of snow we had, a dusting, disappeared. More white stuff this week, supposedly. those pawsies would have been frozen to the floor in an instant. You are two intrepid mancat explorers. That was quite an arctic adventure you two! You two are very brave! I could never have braved the cold and snow like that! We love Dylan's coat all fluffed up for heat! We think you boys might need a dogsled for longer expeditions--MOL!! Wonderful pix of you handsome mancats. Us boys and mama want to thank you for your birthday wishes....you have helped make it a very special day. You two sure are good detectives. You sniffed all those 40 acres. Good job. Those portrait pictures are just wonderful. Another good job. Have a great day. You both did well checking all those strange introoder smells that have got there since you last went out. Both you boys did a magnificent job of checking out the frozen tundra! Brrrrrrr! 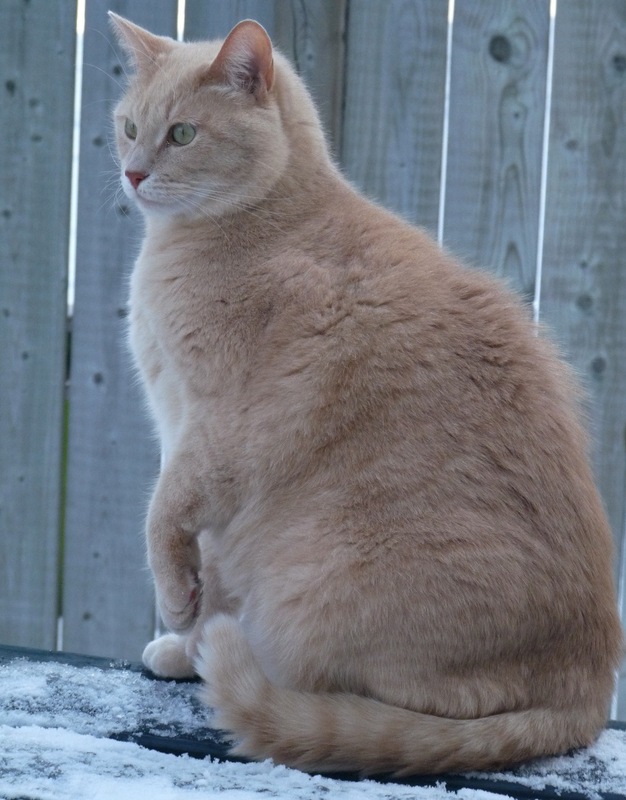 I remember how cold that white stuff was and I don't like it. You guys are super brave to go out in that white stuff... I don't think I'd be so brave. Great cover shots! Dylan has an excellent point stance and Dante holds every fur in its perfect place. I always marvel at your boys lovely colors in any season... but against the white carpet of snow their color are PURRticularly vivid!